This question was quite relevant, as any logic or norm would have led any pilot willing to win, to choose the most modern and competitive machine available on the market; but Lance Capon was one of these knights, who would uncompromisingly and exclusively race 4-stroke bikes. A choice which was however not a hopeless combat, as Lance on his Capon-Vincent won the Bemsee (BMCRC) in 1972, 1973 and 1974 and, despite his fatal crash at Brands Hatch on September 20, 1975, the BMCRC and Newmarket MCC Championships posthumously. 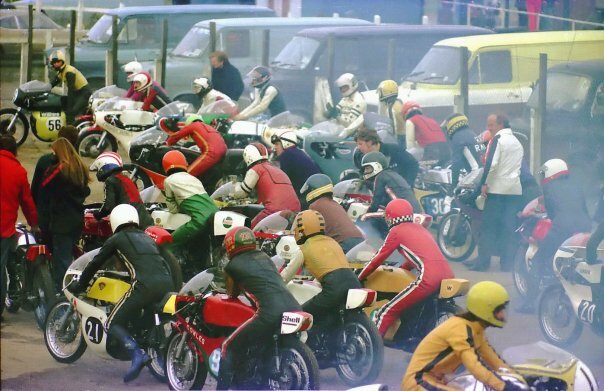 This was almost 40 years ago, but for the enthusiasts who had the privilege to be around the track at that time, Lance and his famous red Vincent flanked with the white C-V logo are still printed in their mind. 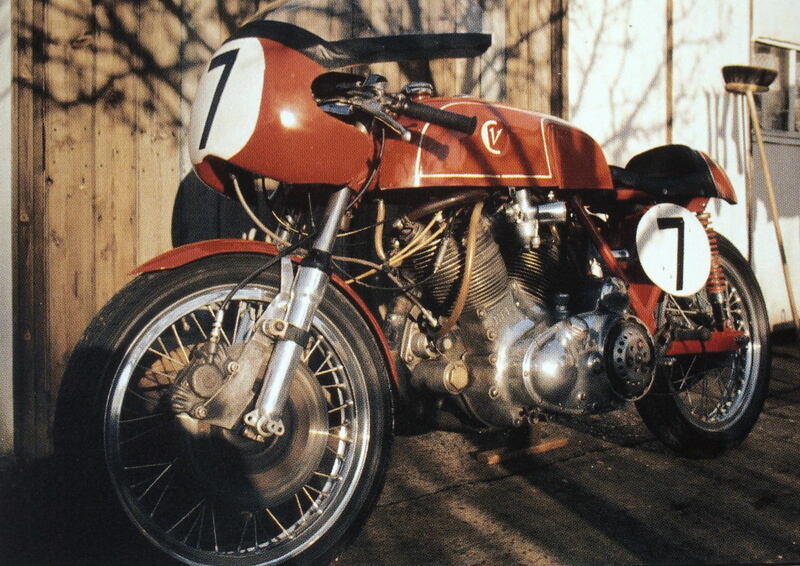 For the others, here is the story of the Capon-Vincent, 8 bikes, which were designed and built exclusively for the track. Lance debuted in 1967 on a Velocette 1939 KSS in a modified Gold Star frame, but having just acquired a Rapide, he shifted gears in April and finished the season with the Vincent along with an AJS 7R. At the end of the 1968, his assessment was quite clear: “the Vincent engine was reliable, quick and powerful, but the handling and the brakes left much to be desired”. So during the winter 1968, Lance designed and built the first Capon frame, the Mark I, which was similar to the Egli frame with its 4” spine oil tank, but also quite different due to its geometry that made the bike much lower. When the 1969 season started, Mark I was yet to be ready so Lance used the stock Rapide while he was completing the new rolling frame in his garden shed. 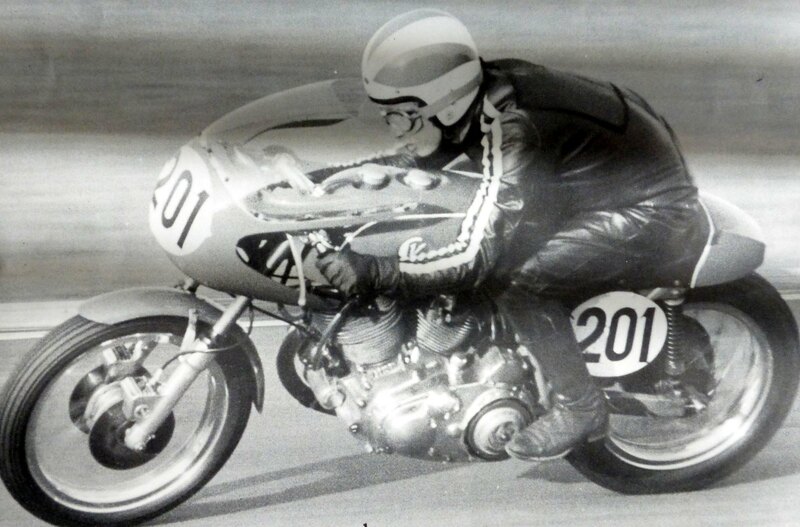 Finally after rebuilding the engine due to a seizure, the Capon-Vincent Mark I took the track for the first time August 23, 1969 at a Brands Hatch in club event, where Lance was able to clock the lap in 1’55” compared to the 2’00” he made with his stock Vincent frame. Mark I was raced during all 1970 season, achieving 2 wins, 8 seconds and 5 third places. The new bike was just ready for the 1972 season, which turned out to be Lance’s best performance: 6 wins, 6 seconds, 9 third and 7 fourths and 1400 miles racing with no problems. This was also during that season that the motto “if it’s going, leave it be” was coined, talking about the Vincent mill. Mark IV was also raced in 1973. With 44 finishes out of 47 starts totaling 1200 miles, Lance won again that year the Bemsee championship. Mark V frame was built during the summer 1973 with some modifications were made to improve the handling and it was ready for the start of 1974, which was made of the same ilk, although marked by a major crash at Snetterton where Lance injured his left shoulder. The front of the bike was seriously smashed and a crack testing revealed that the frame was also damaged, so during the summer, Lance started to build Mark VI. When Lance was ready to race again, Mark VI was not, so he borrowed Mark II for a couple of meetings. The 1974 season ended by a 3rd Bemsee championship and 10 won races to his credit. 1975 started great like the three previous seasons, until Brands Hatch on September 20: Lance won the first race and was fighting for the lead in the second one when he got a major tank slapper coming out of the paddock; he hit the Armco barrier and died from his injuries. As in the 1972, 1973 and 1974 seasons, Lance was then leading the Bemsee 501-1000cc championship and was attributed posthumously the 1975 BMCRC (Bemsee) and the Newmarket MCC. 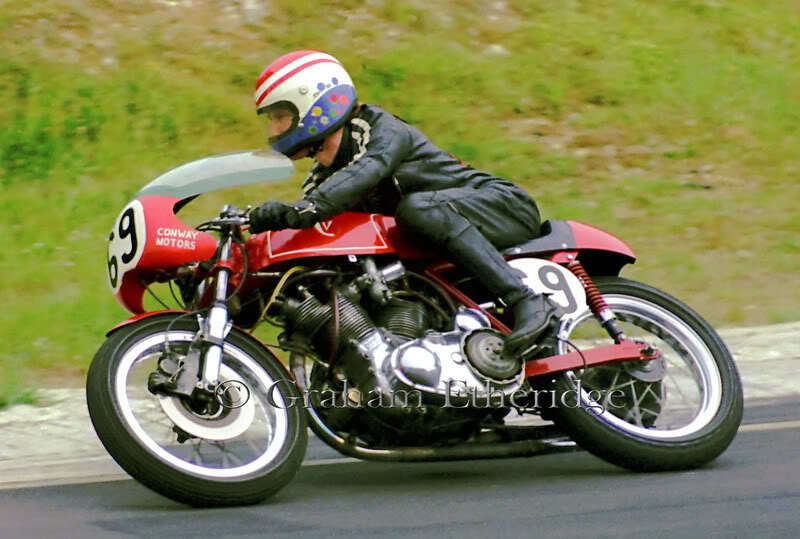 Beyond love, Lance and his wife Anne were bonded by the passion for the race and this fabulous Capon-Vincent. Once Lance was gone, Anne’s first reflex was to repair his bike to bring it back to the track. In 1976, Mark VI was back for 2 or 3 outing piloted by Keith Tyler, but these events were dogged by various mechanical problems, and when a valve dropped into the cylinder, Anne decided to let Mark VI be silent for the next 13 years, tugged between the desire and the sorrow to hear it again. I would like to thank Anne Callagher, Lance’s widow, who was an incredible resource for me to understand the chronology of these 8 Capon-Vincent and Lance’s own story. 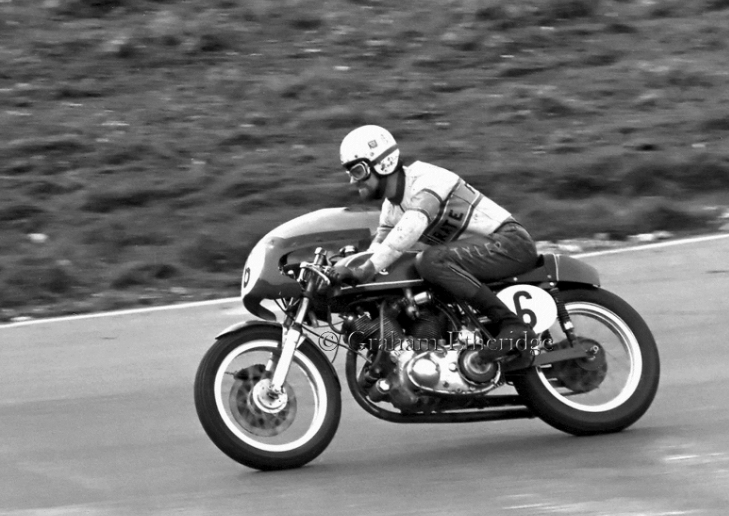 Lance Capon on Mark I in an early outing in 1970 at Brands Hatch. Note that the bike has still its drum brake on the front and has no fairing. Lance Capon on Mark III in 1971. Lance was still wearing his open face helmet. It was likely at the National meeting at Brands Hatch, probably end of May bank holiday weekend. Mark III had a twin front brake and a fairing. 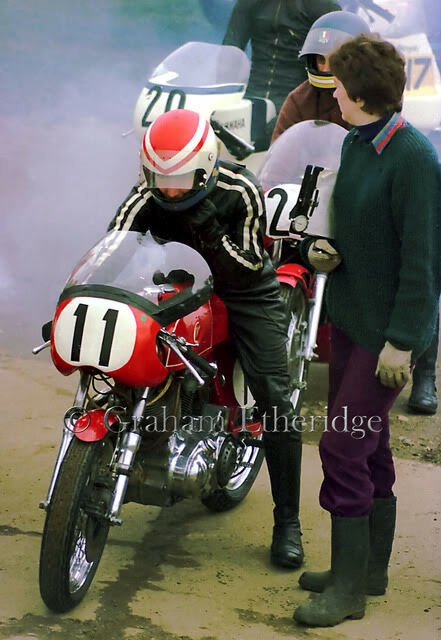 One of the last picture of Lance Capon at Brands Hatch, riding Mark VI in a BMCRC meeting on 14 June 1975. Lance finished 3rd that day. The media were not covering racing in 1975 as widely as they are doing today, so I could not find any picture of Lance without his helmet. I asked Anne, his widow, and she gave me the only one she has, the day of their wedding. Mark VI with Keith Tyler on board. Keith rode it briefly in 1976 after Lance was killed; later that year the bike was retired again until 1989. 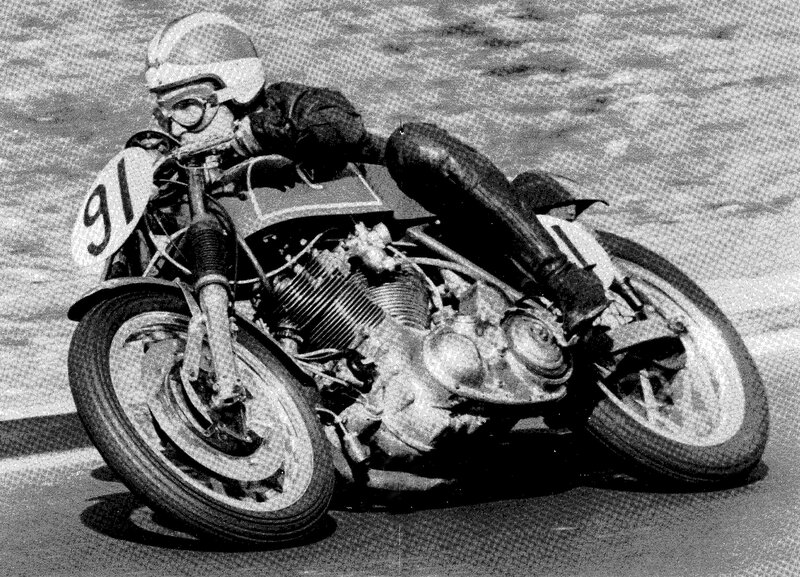 (1) Mark II was in fact the Mark I modified to take a Vincent chopped engine own by Bob Richardson and was also being prepared to race. Barry Gooding rode the Capon bike for many years at C R M C meetings been “missing” for the last 3 years! They also built a replica, painted in blue. In Spring 2010 Barry had a life changing accident while riding a TZ750 Yamaha at Lydden and was forced very reluctantly to stop racing. 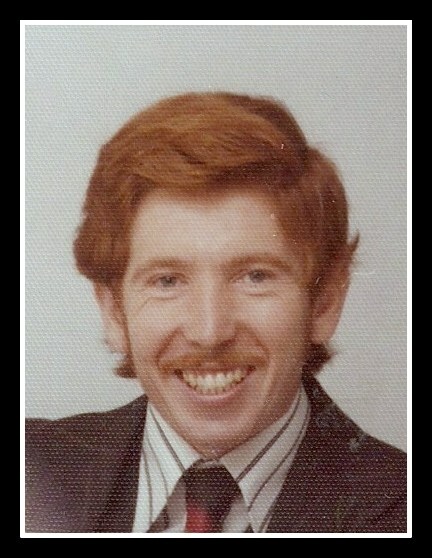 He thinks classic racing in the 80’s and 90’s and riding the Capon was the very best of times. Incidentally he also firmly believes that it is Annes skill as a physio which has given him the post accident( well accidents) mobility he has today. Hi Philippe, I have just read your article with pride for Lance was my Uncle. I was 18 years old when he was sadly killed. We lived next door to Lance and my Grandad Capon and I spent many an evening watching him with his bike working on the frame, I have read this with my Mum (Lance’s eldest sister) and she was moved. I left home when I was 18 and lost touch with Anne, please could you forward my email to Anne. Was at clearways that fatal day along with hearing about Joeys death one of saddest motorcycling days of my life always loved to see him putting it over modern bikes. I met Lance and Anne as a teenager and thought they were were amazing. My eldest brother Clive married Lance’s widow Anne and tried unsuccessfully to bring the Capon Vincent back to where Lance had sadly left it. But of course, There was only one lance and Ann team, If there was a ranking for British unsung heroes. Lance and Anne would be right up there. Lance for being a fantastic bloke and Anne, an amazing woman. A bygone era, but we really should celebrate people like Lance and Anne. Class, style, integrity and professional to the core. Memories, ah Memories. !!!! I was a friend of Lance, and raced a bit in the mid 70’s. There was a bike made for Lance not sure by whom, had a Capon frame and a Vincent engine coupled to a Norton gearbox (the Vincent gearbox wasn’t so versatile, and could only offer 4 ratios). Lance rode it in a practice session at Snetterton in the summer of 1974. The bike was quite fast but suffered with ground clearance problems, Lance decided that he didn’t have the time to sort out the problems mid season and kept racing his own bike for the rest of the season. Rob, thanks for your contribution, I believe that through the different generation of frames the ground clearance has been addressed. For the 4-gear issue there was only one solution and chop the engine to install a gb that had racing close ratio. A Surtees 5-geqr now does the job.